Paper Crafts by Candace: Did someone say Pie? Hi everyone! Happy Tuesday! Today is my day over at SVG Cutting Files! 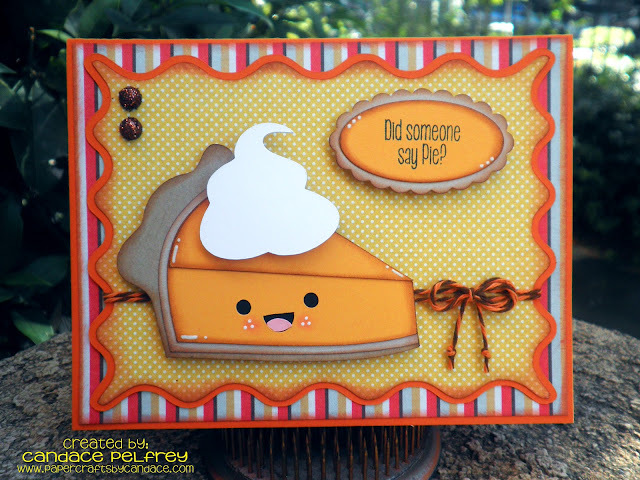 I am in LOVE with this pumpkin pie card! Super Cute Pie:) Love the shape of the mat too. cute card....is the mat from svg cut files also? Such a FUN card!! Great paper choice and I love your pie cut! So cute! TFS! This is darling, you are so talented! I absolutely adore this sweet card! SUPER CUTE!!!! LOVED it in person even better!!!!!!! CUTE!!!! Oh Geez!!! Total dork here! I should have gone to your blog LOL! I love this card! ITs is so adorable and yummy looking! Jaded Blossom Stamp Release Week - Day 2!